Your bike is your transport, your gym, and perhaps even your pride and joy, so you’ll want to keep it safe. Over half a million bikes get stolen in the UK every year and if you’ve signed up to cycle for charity the last thing you are going to want it to have you bike stolen. However, help is on hand and although no product can guarantee your bike won’t be pinch using your bike frame number, you can register your bike on immobilise.com so that if the worst does happen, the police will have the best chance possible of tracking it down. To avoid that, keep your bike secure at all times. At home, store your bike out of sight and ideally in a secure locked shed or garage. It’s worth locking it with your bike lock there too. When you are out and about, a good quality bike lock and proper use of it is essential. As with most things in life, you get what you pay for so it is worth spending as much as you can afford. After all, think of how much it would cost to replace. You need to secure as many parts of your bike as possible. Thieves will take anything they can get off your bike, including the seat or front wheel so get the frame, the wheel spokes, and any other part possible encompassed in the lock. 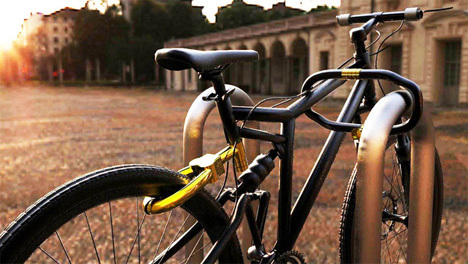 You could even use two locks, one to lock your bike against a secure structure, another to lock on the front wheel etc. This will also deter those opportunists! It’s obvious really but out of sight is out of mind. Don’t lock your bike somewhere really conspicuous and try to vary the location a bit if you’re parking in the same kind of place. Don’t leave valuable panniers, saddlebags, lights, speedometers, or any other gadgets attached to your bike… they probably won’t stay there for long! You could even consider taking your saddle - yes they will even take that, and you wouldn’t fancy riding home without one! Take a bike bag with you so that you can strip them off and take them with you. You wouldn’t leave your satnav in your car, and with a bike there’s no glass in the way of a thief’s light fingers.